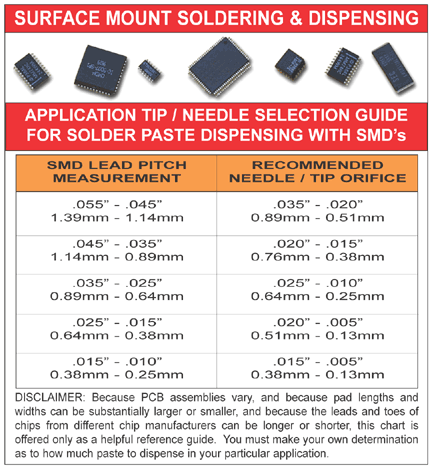 How To Solder Surface Mount Devices & Chips With Solder Paste & Hot Air. SMD Soldering! We Pioneered It First! Yes, High Quality Production Solder Joints Complete with Fillets at Your Bench! Make Sure PCB Assembly is Level and Secure. Place your PCB Assembly into the ABC-1 Adjustable Board Cradle and above the ZT-1 AIRBATH as shown at the left. Always Preheat. Switch the ZT-1 AIRBATH to "Warm" at industry recommended setting of 150°C. How long? The process itself will tell you. When bead of solder paste runs (30-60 sec), flux has activated and the PCB is preheated. Above: A superior solder joint for SMD's. Here's how to make good solder joints: A bead of solder paste is applied to the pads, followed by placement of the SMD onto the pad and seated into the paste. It's elementary: What is a good solder joint? A solder joint made at the bench with the same materials and processes used in premium production conveyor ovens will be the same. The above example is made with a "gull winged " SOIC 20. This same method works equally well with the "J" leaded PLCC's. For finer pitched components, such as the popular QFP 100 and the QFP 208, a slight variation in technique is easily made with equally, if not even more effective results (call Zephyrtronics for details...we can't teach our competitors all of our tricks). 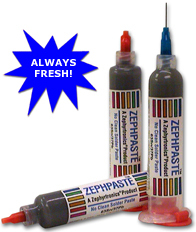 For SMD Component Removal, please be sure to see LowMelt® Process of Co-Metalization and Rapid SMD Removal in Less Than 180 Seconds and learn more about the history and benefits of the popular Zephyrtronics LowMelt DeSolder®. Please note: Zephyrtronics has conveniently packaged all of the above described chemicals, ZephPaste Solder Paste, Anti-Static Swabs, SMT/Dental Probes, LowMelt® DeSolder and more in the LMK-1000 SMD Benchtop Kit our Blueprint for the Bench™, or best of all, please visit our Systems Section in this Website where our more popular, comprehensive benchtop systems are graphically presented. ©1996 - 2011, 2012, 2013, 2014, 2015, 2016-2018, 2019 by Zephyrtronics®. All rights reserved. The information, text, images, photographs, charts, graphs you receive online from Zephyrtronics® are protected by the copyright laws of the United States. The copyright laws prohibit any copying, redistributing, retransmitting, or repurposing of any copyright-protected material. Zephyrtronics is the registered trademark property of JTI, Inc. "The Science of Zephyrtronics" and "Simplicity Through Innovation" and "Zephlux" and "ZeroLead" and "Zero Balling" and "Zero Residue" and "Post Cooling" and "Post Cooler" and "AirBath" and "SolderGlide" and "SolderMill" and "ZeroTouch" and "Just So Superior" are the protected trademark property of JTI, Inc. "Zephyrtronics" and "Low Melt" and "Air Fountain" and "Fountainhead" are the registered trademark properties of JTI Inc. *The above names are the registered property of their respective owners.